UPX 3.02 has been released. Please report all problems and bugs in our bug tracker. Also have a look at the more detailed ChangeLog. UPX (Ultimate Packer for eXecutables) is a free, portable, expendable, high-performance executable packer for several different executable formats. It achieves an excellent compression ratio and offers very fast decompression. Your executables suffer no memory overhead or other drawbacks because of in-place decompression. 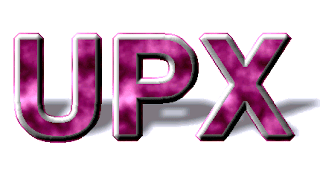 UPX is copyrighted software distributed under the terms of the GNU General Public License, with special exceptions granting the free usage for commercial programs as stated in the UPX License Agreement. UPX uses the NRV compression library for compression services. A compatible but somewhat less efficient open source implementation is available through the UCL compression library.